DIAMONDS defender Courtney Bruce cannot wait to get back on home soil for Tuesday's third game of the Constellation Cup series. 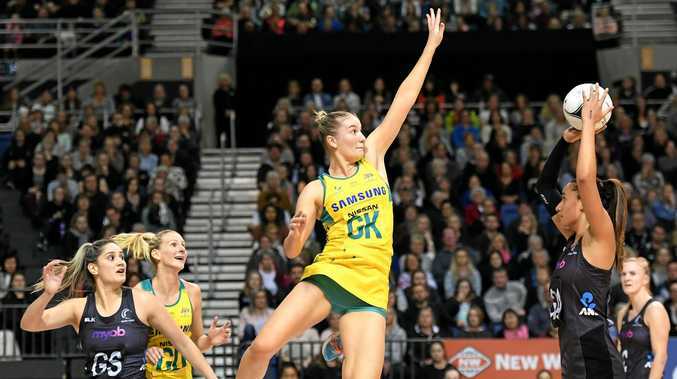 The Australians have beaten the Silver Ferns in New Zealand twice in the past week and now have games in Adelaide on Tuesday and Sydney on Saturday to round out the series. The 23-year-old Bruce said she wanted to put on a show for the home fans. "It's always hard to win on New Zealand soil, so getting this second win really reassures all of the positive things we have been doing in training," she said. "I can't wait to get back to Australia and have an Aussie crowd behind us, playing at some venues that we're used to. "I'm just excited to look up at the crowd and see a lot of green and gold." Bruce said that the intensity of the Silver Ferns contests had helped her develop her international game. "I still pinch myself every time Lisa (Alexander) says that I'm getting the opportunity again," she said. "The intensity is crazy. I enjoy playing it, I know it's helping my game."